When was the last time you visited the bathroom and had a successful bowel movement? A day ago? Maybe three days ago? Constipation is classified as fewer than three bowel movements a week or small, hard bits of stool that are painful and difficult to pass. Constipation is a common problem, with estimates of 42 million people nationwide struggling to have regular bowel movements. Diet is a large factor in constipation and can either relieve it or make it worse. The main factor is fiber. Fiber is great to keep things moving along, but in some cases, it can be the cause of your problems. Consuming too much fiber without proper hydration can cause stool to stick, harden, and become difficult to pass. On top of being conscious of your fiber intake, here are seven other foods you should avoid if you aren’t able to go as smoothly as you’d like. Dairy: If you are lactose intolerant, avoid dairy. For some, dairy can lead to diarrhea, while others suffer from constipation. Some dieticians will warn patients against dairy if they are already constipated, as it can lead to feeling bloated. Fried food: High-fat foods can contribute to stool blockages because they tend to be some of the lowest in fiber. Furthermore, high-fat foods are difficult to digest, making you feel even more sluggish. White flour: White flour doesn’t have as much fiber in it as other types of carbohydrates do, and the more you eat, the harder it is to pass a bowel movement. Instead, opt for whole grain or high fiber carbohydrates. Tea: This is pretty shocking because many people reach for tea as a means to get things moving. But not all teas are the same, and a regular bagged black tea which contains tannins can bind stool together. Furthermore, a tea with a high amount of caffeine can dehydrate the colon, making it more difficult to pass stool. If you do want to drink tea, stick to the herbal variety. 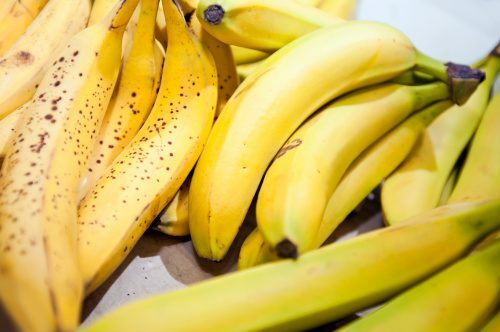 Bananas: Bananas are often recommended as a constipation aid but sometimes can keep things stuck inside instead of letting them out. Apricots: Apricots are a good source of fiber, but if you’re already irregular, avoid dried apricots. It’s easier to overeat dried fruit, causing you to intake too much fiber. Rice: White rice lacks the fiber that is found in brown rice. If a meal is calling for rice, opt for the brown variety so you don’t end up constipated. How to have regular bowel movements?